Even though they’ve been the best known competitors to Apple’s dominant iPad, Samsung’s Galaxy Tab tablets have lagged far behind the leader in popularity. For instance, according to documents Samsung had to release at a patent trial last week, three leading Galaxy Tab models, combined, had sold just 1.4 million units in the U.S. from the fourth quarter of 2010 through the middle of 2012. Apple documents said it sold 29.7 million iPads in the U.S. during the same period. So, Samsung is trying something new. This week, it is releasing a new flagship full-size tablet, the Galaxy Note 10.1, designed around two key features the iPad lacks—a stylus and several apps that allow you to use it for note-taking and sketching, and the ability to view two apps at once in a split-screen view. In particular, Samsung is betting on the stylus, which the company calls the S Pen, to attract users who find typing on glass to be limiting and might want, at least occasionally, to simulate pen and paper. The late Apple CEO Steve Jobs disdained the stylus as a tool, although lots of third-party styluses are now sold for use even with the iPad. 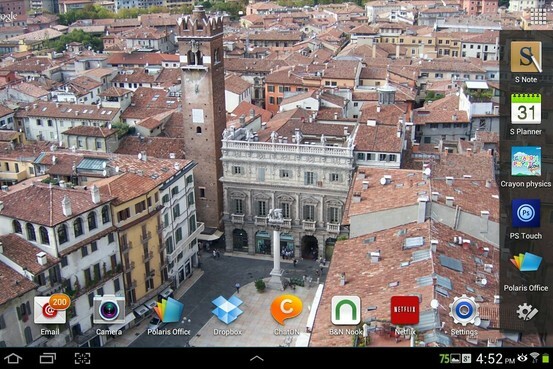 I’ve been testing the Galaxy Note 10.1 for the past four days and, in general, I like it. It works smoothly and quickly, and the stylus and split-screen features perform as promised. However, I found its battery life to be much lower than the iPad’s, and some of Samsung’s software to be overly complicated. Plus, even Samsung concedes that the key differentiator, the pen, isn’t likely to be used by most people most of the time. Still, I can recommend the Galaxy Note 10.1 as a better choice than the iPad for people who value the stylus or split-screen capability, or for those who prefer Android. This new tablet builds on a previous Samsung stylus-equipped product, a 5-inch Galaxy Note released in February. But that device was actually a huge $300 phone, with some tablet features, a sort of tweener product that some nicknamed a “phablet.” This new Galaxy Note is a pure tablet about the size of the iPad and with the same base price of $499.99 for a 16 gigabyte version. The Galaxy Tab will remain available. Like other Samsung products, the Note 10.1 is based on Google’s Android operating system, with some software features added by Samsung. It uses last year’s version of Android, called Ice Cream Sandwich, though Samsung promises an upgrade to the newer, sleeker, Jelly Bean version at an unspecified date. Pen-compatible apps pop up on the side of the screen when the pen is removed from its slot. The new tablet looks different as well. It has a plastic case with a thin, silvery border, twin front-mounted speakers and a storage slot for the stylus. Also, unlike the iPad, it has an easily accessed slot for extra-cost flash memory cards that can expand its storage. It’s lighter than the iPad and slightly thinner. The new Note has much lower screen resolution than the new iPad, though I found videos and photos looked good. The front and rear cameras were decent, and the twin front speakers sounded better than the iPad’s speaker on the back. Using the S Pen for simple handwriting or sketching was easy. It can detect over 1,000 degrees of pressure, so you can learn to make lines thicker or thinner based on how hard you press. But you don’t want to lose the stylus: It costs $40 to replace. When you remove the pen from its slot, a menu of mostly pen-compatible apps pops up on the side of the screen. The primary app for the pen is called S Note. It’s essentially a free-form electronic pad. You can jot down notes or sketch in it. The notes can be translated into handwriting, something I found worked only moderately well. S Note also can transform shapes you draw, like circles or triangles, into perfect images. This worked great for me. Most of these tasks were simple to do, though there are a lot of menus and choices that can make this easy app complicated. And if you’re drawing something that requires scrolling, you’re forced to use a mini-version of the page to scroll to the place you want. I also tested the pen in two non-Samsung apps that are bundled with the device. One is Polaris Office, an app that handles Microsoft Office documents. Here, you can annotate documents by hand, but not create them with handwriting. The other is an Android version of Adobe Photoshop, called PS Touch, where the pen proved handy in tasks like cutting unwanted backgrounds out of photos. The pen can also be used in place of your finger to navigate through the tablet. Samsung says it doesn’t expect many people to use the pen this way. In fact, a spokesman said the company sees the pen as something most people will only use some of the time. 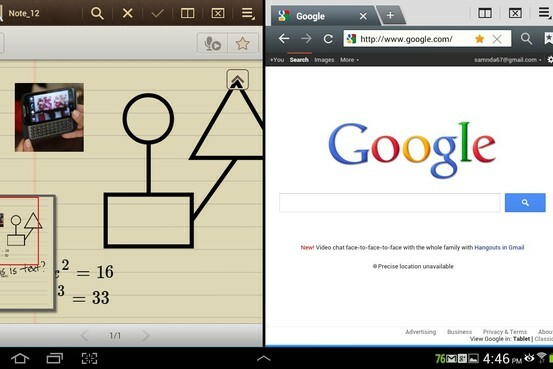 In the Galaxy Note 10.1, some apps can share the screen, and you can copy and paste between them. The split-screen feature works with a limited selection of apps, such as S Note, email and the browser. While in this multiscreen mode, each app takes up half the screen, and you can copy and paste content between them. I liked using this feature, but found copying and pasting often required multiple, clumsy steps, like taking screen shots of what’s in one app, and then cropping. In addition to the stylus and split screen, the new Note has some features, mostly about beaming and sharing content, carried over from Samsung’s new Galaxy S III smartphone. As on the phone, I found these somewhat complex. Like the iPad, the Note will be able to beam content to a TV wirelessly, via an adapter, but the adapter isn’t ready for release yet. Another useful feature on the Note is a pop-up row of mini-apps at the bottom of the screen. These are stripped-down versions of core apps: email, calendar, calculator, music player and S Note. I also liked a video feature: You can view a movie in pop-out mode. It appears in a small window and continues to play while you do something else, like surf the Web. Another nice video feature missing on the iPad: You can set the video player to auto-play a series of videos, one after another. The biggest downside of the Galaxy Note 10.1, in my tests, was battery life. Using my standard, tough, tablet battery test, it lasted only seven hours and 27 minutes between charges, about 2.5 hours less than the Apple device. With its stylus and split-screen features, the Galaxy Note 10.1 may well give Samsung the boost it needs in the ever more competitive tablet wars. An earlier version of this article incorrectly had the price of the Galaxy Note 10.1 as $499.